Made this for a Halloween Party... 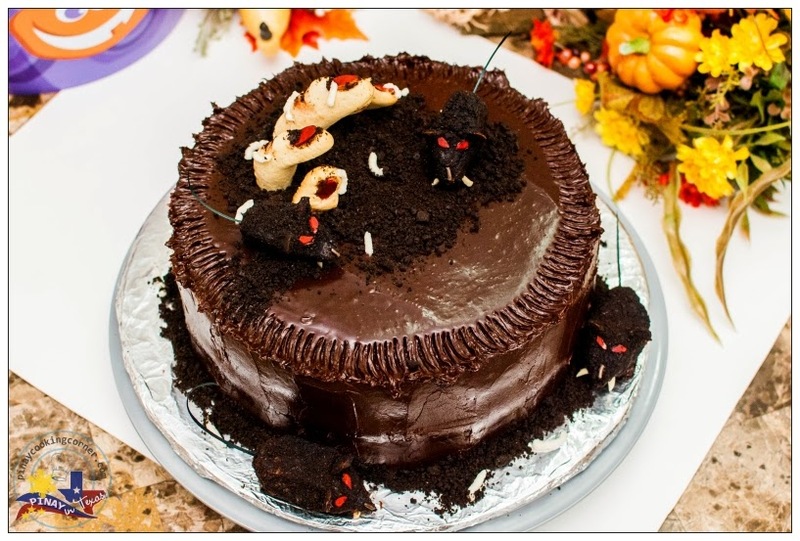 It's a Chocolate cake with cream cheese filling, covered with dark chocolate ganache and decorated with finger cookies and chocolate rats. It's actually my first time to make a Halloween cake and I must admit I had fun! Though the chocolate cake, as well as the filling and the frosting are something I usually make, both the finger cookies and chocolate rats which I used for decoration are new to me...and I tell yah, I enjoyed making them! 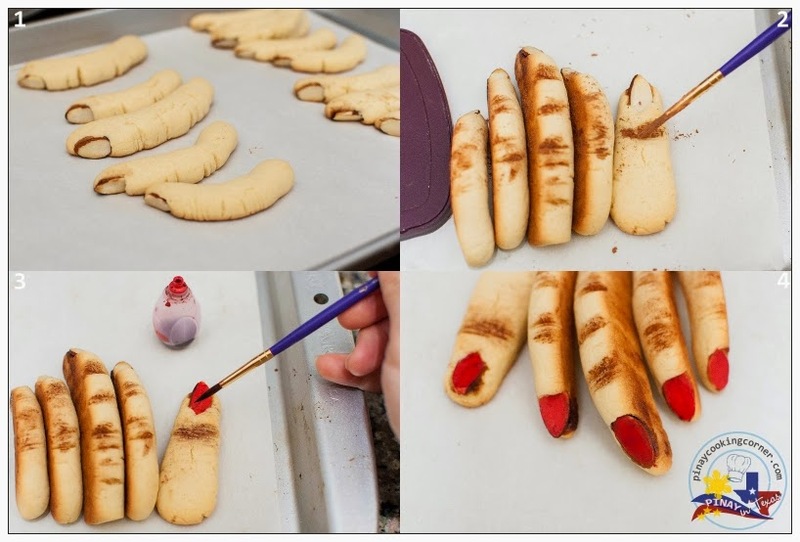 Want a creepy treat for Halloween? This is just perfect...so check it out and give it a try! Wishing you all A HAPPY HALLOWEEN! 1. Preheat oven to 375°F. Line a cookie sheet with parchment paper. 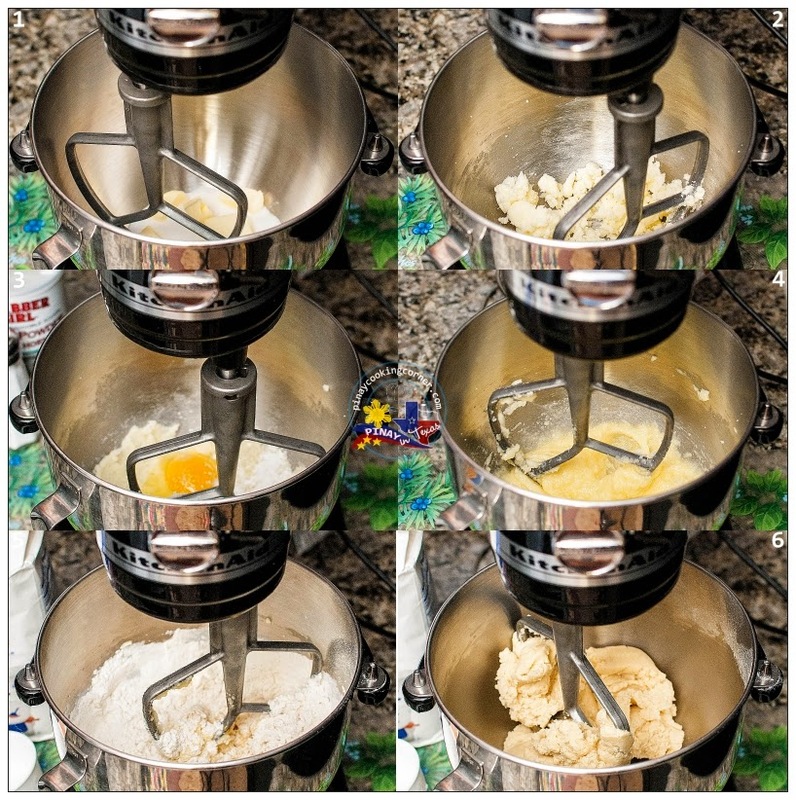 Cream butter and sugar in a mixing bowl until light and fluffy. 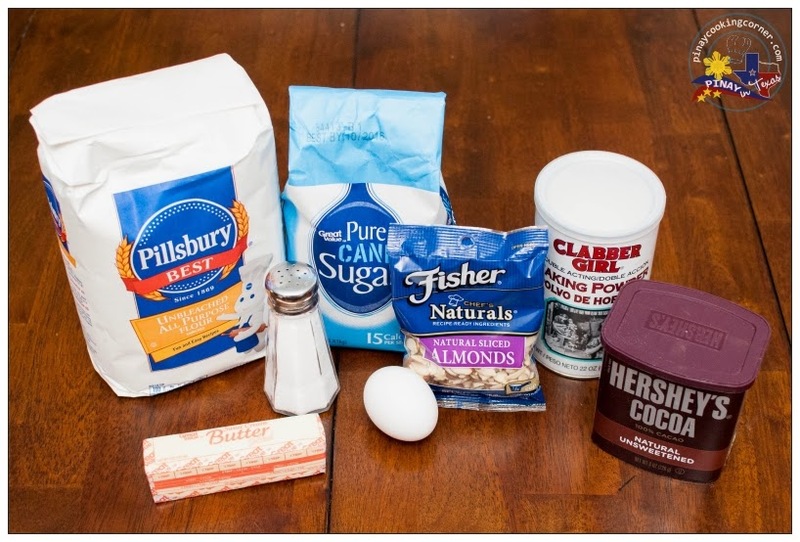 Add egg, salt, baking powder and flour. Mix until well combined. If dough is too sticky, add some more flour 1/8 cup at a time until desired consistency is achieved. 2. Form dough in ½" balls. 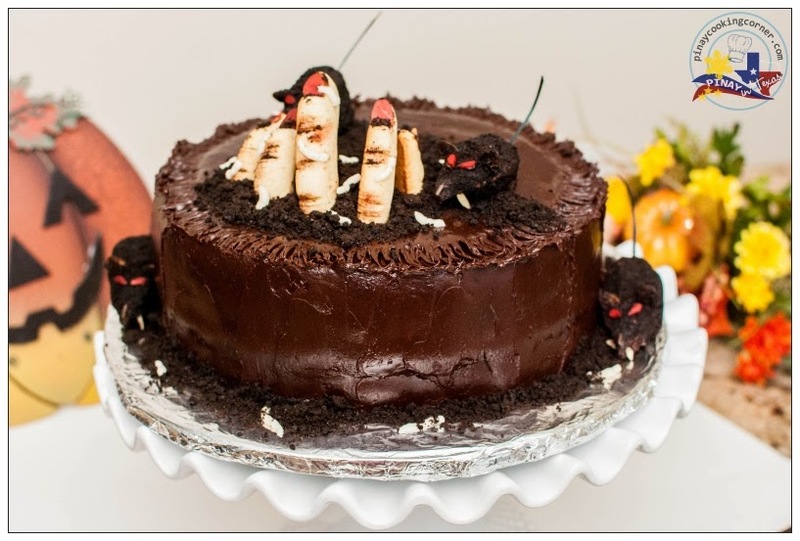 (You will only need 5 for this Halloween cake but you can bake them all for finger cookie treats!) Shape dough balls into logs of varying length. 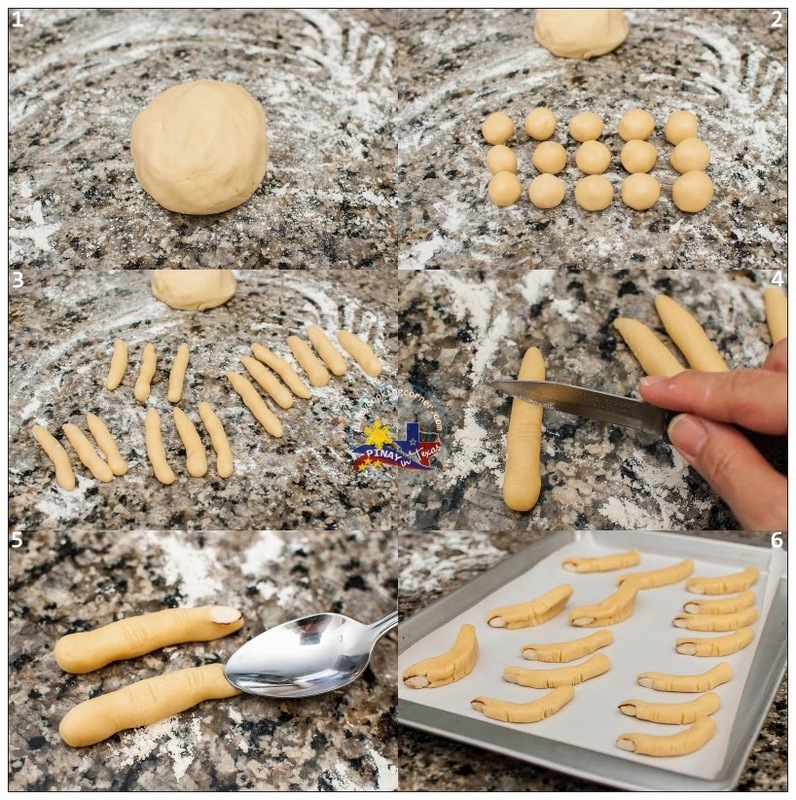 Put logs on a floured surface, and using your own fingers as a guide add some contours. With a toothpick or pairing knife, add some nice crevices about half way through the dough from the top and for the knuckle wrinkles at the 1/3 and 2/3 marks of each log. Using a teaspoon, create a nail bed on the finger tip for the almond slice. Add the almond slice slipping it bit under the nail bed so they hold, and tweak your finger sculpture so it is finger like. 3. Transfer fingers to the prepared cookie sheet. Bake in preheated oven for 10-12 minutes. Remove from heat and allow to cool down. With the small paintbrush, paint in the cocoa powder into the wrinkles and the rim of the nail bed fairly generously. Wait a bit and then shake and blow off the excess powder, and clean up any powder not in crevices with the brush. Color nails with red food coloring (optional). 1. Cream together the butter and cream cheese until fluffy. Add the vanilla extract. Add confectioner's sugar. Beat at low speed until mixed, then on high until smooth. Reserve about ¼ cup for maggots. Set aside. 2. Spread remaining cream cheese mixture in between the cake. 4. When ganache has completely cooled, beat until soft and fluffy. Reserve about ½ cup for chocolate rats glaze. Line a cookie sheet with parchment paper. Using a kitchen scissor, cut the top part of the sub roll in tear shapes. (Y aped roll and about 1 inch apart — to make the ears of the rat. Insert a fork into the large end of the shaped roll. 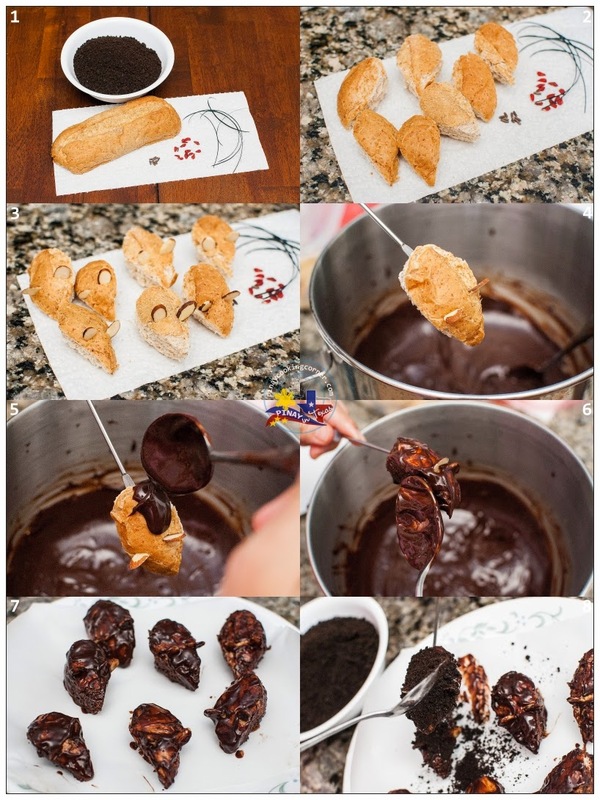 Holding each shaped roll on fork over container of dipping chocolate, spoon chocolate over it to coat. Allow excess chocolate to drip off, tapping fork lightly. Sprinkle with Oreo crumbs to coat and transfer the roll to prepared cookie sheet. Add red almond bits for the eyes, slivered almonds for the teeth, and brown candies for the nose. Repeat with the remaining tear shape rolls. ">Insert licorice in back side of each chocolate-covered roll for the tail. Repeat with the remaining tear shape rolls. To assemble: 1. Spread chocolate ganache on the layered cake. 2. 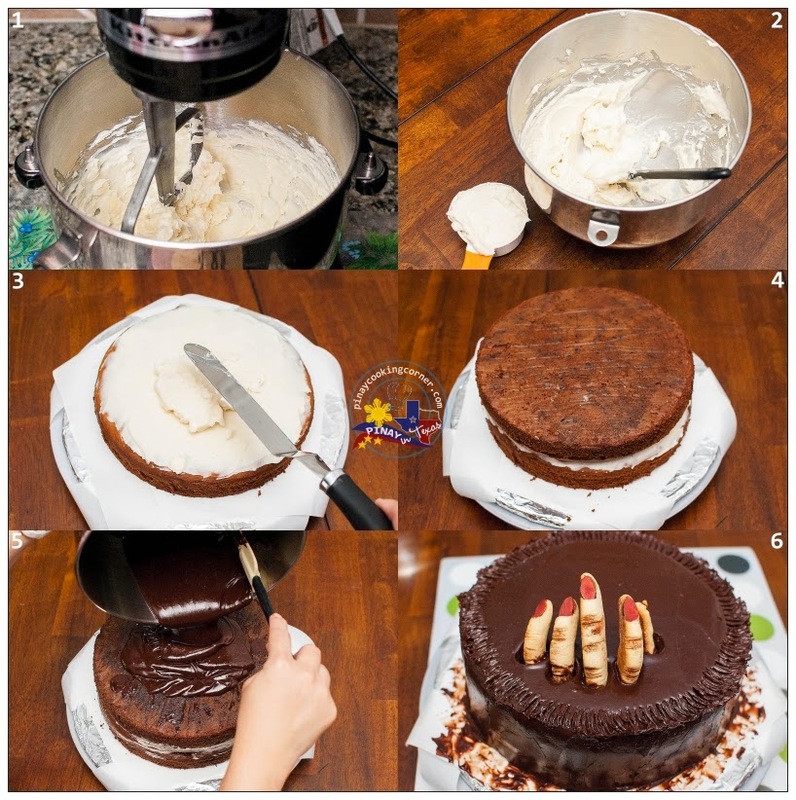 Stick the fingers to the cake then sprinkle some oreo crumbs around them. Piped cream cheese around dirt to look like maggots. 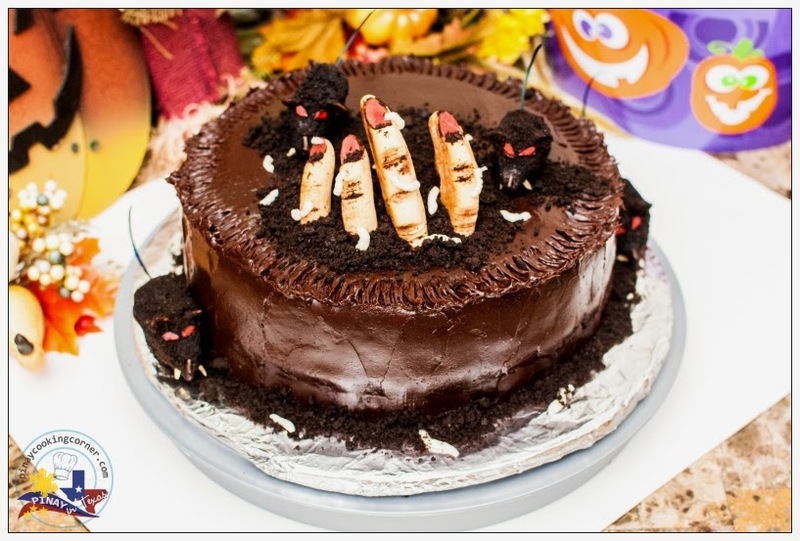 Place chocolate rats on the cake as you please. Ohhh, that's one creepy cake!